Some random pics from a week in the Cairngorms. It's a really beautiful part of the world, and full of wildlife, so I thought I'd show some of it off. First off - something of which I have never seen the like (is that grammatical?). Can anyone tell me who this tiny Toad in the Hole is? He might be a Common Toad, but they are apparently not common in Northern Scotland. We found him in a hole in a very dry path which seemed an unlikely place. Obviously he was christened Zombie Toad by the children. He was remarkably expressive for a toad, and obviously just wishing we would go away. On the other hand, this obliging chaffinch sat on his perch for about 5 minutes. The hilltops were covered with alpine flowers. There are also carnivorous (well insectivorous) plants in Scotland! One evening we took the children out for an evening walk to see if we could spot some deer and managed to see eight, mostly solitary ones. I hadn't realised before how loudly they bark. It meant that we were out in time to catch this view and sunset. 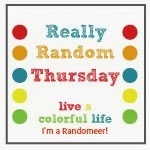 Linking up to Random Thursday! Loving your photos - particularly the insectivorous plant, it's stunning. We had a fantastic holiday camping at the foot of the cairngorms many years ago pre children. Good memories. Such beautiful photos! I can't say I've ever heard a deer bark, in fact, I thought they look like very quiet creatures! I can't shed any light on the toad I'm afraid. He does look very comfy in his hole! Those plants sound just perfect for reducing the midge population! What amazing pictures Catherine...and the chaffinch?! !